A new video captures the giant asteroid 4179 Toutatis tumbling through space on its flyby of Earth earlier this week. The asteroid Toutatis video, which is about 40 seconds long, combines 64 radar images taken Wednesday and Thursday (Dec. 12 and 13) by NASA's Deep Space Network antenna in Goldstone, Calif. On those days, Toutatis was about 4.3 million miles (7 million kilometers) from Earth, or about 18 times farther away than the moon is. 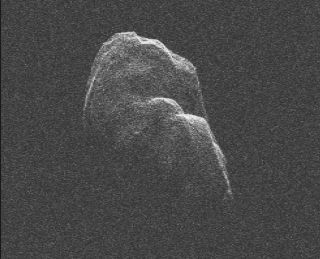 The new radar images — which have a resolution of 12 feet (3.75 meters) per pixel — show the 3-mile-wide (5 kilometers) asteroid in striking detail. Toutatis is revealed to be an elongated, irregularly shaped object with multiple ridges, researchers said. Strange bright glints may indicate surface boulders, they added. The video also sheds light on how Toutatis moves. The asteroid spins about its long axis every 5.4 days and wobbles through space like a badly thrown football, scientists said. Nevertheless, the Minor Planet Center in Cambridge, Mass., lists Toutatis as a potentially hazardous object, meaning that it could pose a risk to Earth at some point in the future. Toutatis would cause catastrophic damage if it ever did slam into Earth, potentially extinguishing humanity and many other species. In general, scientists think a strike by anything at least 0.6 miles (1 km) wide could have global consequences, most likely by altering the world's climate for many years to come. Asteroid Toutatis makes one trip around the sun every four years. Its next close encounter with Earth will come in November 2069, when the space rock will fly safely by at about 1.8 million miles (3 million km), or 7.7 Earth-moon distances.